If T.S. Eliot was right and April is the cruelest month, then September surely qualifies as the most restless. On an afternoon trip to the Johnny Gunter place, I rounded a bend on Upper Smith River Road and spotted a large lump of coal-colored feathers stretched prone near the center line up ahead. “Large dark bird” was all my mind could register, so I hung a U-turn to investigate. 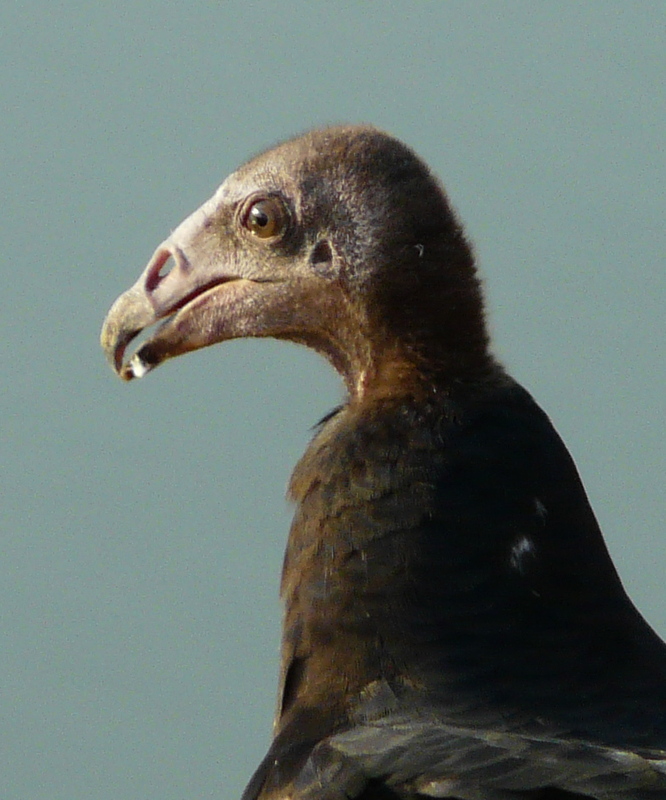 It was a Turkey Vulture, a juvenile judging by the black head. They do well foraging on road kill of various sorts. But I’ve never seen one that ended up dead in the process. Perhaps youthful inexperience was too much to overcome. Most of us are fortunate to have survived our youth. I couldn’t leave its elegant naked-headed body to be mutilated beneath the large tires of Monday morning log trucks. But a full burial seemed inappropriate given Turkey Vulture culture and evolution. So I drug it’s stiffening corpse to the shoulder to become a strand in the local food web—perhaps dinner for a scavenging skunk or raccoon or bear. 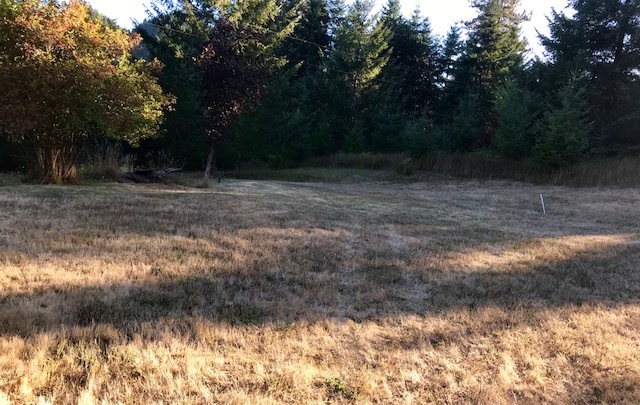 The meadow stretched beyond the cabin like tawny cat, shadow stripes lengthening in late afternoon. The robin’s nest on the porch was empty. Barn Swallows no longer swooped and chittered into their mud and grass cups clinging to the rafters of the garage. I knew they were gone last weekend when the sky was carved by arcing Violet-green Swallows. Had the Barn Swallows been there, they would have fought the Violet-greens out of their airspace. From the dirt floor of the garage, I gathered piles of swallow poop into a bucket to fertilize the garlic bed later this fall. Also gone were melodious thermals of Swainson’s Thrush songs rising into the moist evening air. Rather, a cloud of dry cricket music buzzed above brown seed heads of meadow knapweed next door. I keep the knapweed mowed on our side of the meadow, but crickets clearly prefer those tall unkempt weeds on the neighbor’s place. Crickets don’t give a flip if knapweed is introduced and invasive. They’ve made their peace with this hybrid landscape. Desiccation has its place, even in the garden. Dry bean plants had become jaundiced, so I removed their lifeline of water from the spring to allow the pods to ripen and dry. 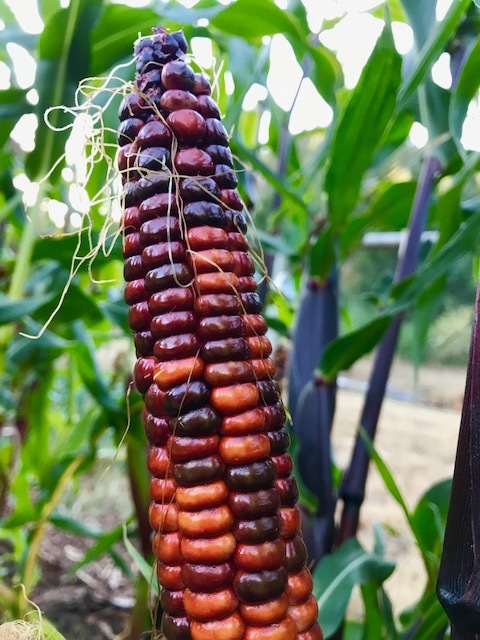 Painted Mountain corn was ready to shuck on the stalks. The ripping sound of violated ears broke into the relentless breeze brooming Douglas fir boughs. Twilight. Wind faltered, then whisked off to some distant place. Stars blinked open, uninhibited by the black new moon sky. Even Moon must rest occasionally. September, that indecisive space between summer and autumn, has always made me unspeakably restive. When I was much younger, September gave me butterflies. This evening my bones felt hollow in the dying light. I am still very alive, but too rooted, too old to fly. Peace must find me here, on the ground, inhaling cricket song.